Forget Must See TV. Now it is Must Green TV! The reasons are simple. Even though I watch more then TV then most folks I rarely watch them on the broadcast day (thanks to Tivo/PVR) so I would just feel silly talking about shows that are a few weeks old……….and I choose not to talk too much about the environment (even though I have in the past) because….well….everyone else is and I don’t think I have anything interesting to add to the conversation. That is until today….and I am combining/complaining about both! 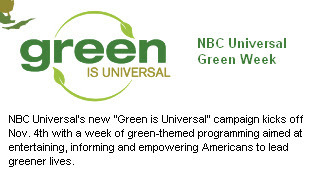 This week NBC launched a GREEN IS UNIVERSAL campaign where for a whole week NBC shows worked a “green” message into every one of their prime time shows and interstitials. This may have seemed like a great idea in a board room but in execution it left me feeling as if I was being pandered to. Shows like 30 Rock, My Name is Earl, ER, The Office, Life, Chuck, Bionic Woman all have smart writing staffs and I watch and enjoy every one of these shows (yes…even Bionic Woman…and geez I watch a lot of NBC shows) but the Green Messaging in these episodes seemed forced (by the studio and the dialog) because……and I am making a HUGE assumption here…..I imagine this green decision came after the shows where plotted out or even written. I feel this way since in Bionic Woman (and I am going by memory here) the good guys looked for the bad guys at an environmental fund raiser but instead of just saying in passing that “this is a environmental fund raiser” they instead worked in a full soliloquy about how this fund raiser was helping save this and that they are happy to be looking for the bad guy here. ER was almost as bad because they had a character complain that his carbon footprint increased due to a prank they pulled on him. 30 Rock was funny because they pretty much admitted they were doing this because they had to. Anyway my point here is this “Don’t mess with my TV” or better stated….this seemed crass and commercial. Two things that saving the environment are not supposed to be about. These episodes will seem strange out of context and if you are going to do a promotional tie in like this you don’t want it to harm your product in the process. NBC dropped the ball here and could’ve achieved the same results they set for their Green is Universal week by not playing with their shows and just had the stars/characters do the PSA’s and interstitial in between the episodes. This could have saved them from getting characters to comment on how they are giving up Styrofoam cups only to have them go back to their old ways in future episodes. I agree, Saul! I too saw several of these shows, and I think 30 Rock’s was the best, because it was the most honest.